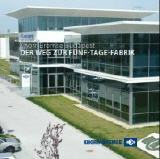 The Knorr Bremse AG is worldwide the leading manufacturer of brake systems and systems for automotive and rail verhicles. Today only in the segment brake systems of rail vehicles are achieved more than 2.3 billion € of turnover with 12,000 employees. Under the motto "new facilities and technology are not enough - it depends on the contents and the processes", all processes and structures and an intelligent, process-covering 5-day time grid was achieved. The result: turn rate doubled, 30 % more productivity and lead reduced to 35 %. We have the opportunity to get to know the concepts and processes on site and to discuss them with the management. Ort: Participants will be informend after registration. 19:00	 Possibility to meet participants who arrive a day before the meeting. and the Board of the GfPM e.V.